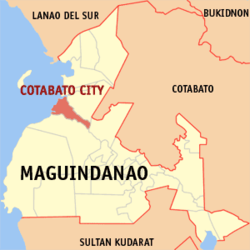 In the nineteenth century, when Sultan Makakua ruled, roads and wharfs were constructed which gave rise to the birth of modern day Cotabato. However, the then Municipality of Cotabato was first organized at the later part of the 19th century when the Spaniards established a military post at what is now Barangay Tamontaka, one of the earliest Christian settlements founded south of the Phiippines. Cotabato was then officially founded in 1862 when the Pueblo de Cotabato was established; Christianity was introduced in the area in around the year 1870. As of 2010, Cotabato City had a total population of 271,786 and it continues to increase as some immigrants from other nearby provinces and towns come to live in the city. The city is situated in the lowest portion of Maguindanao province. The City of Cotabato with its 37 barangays spans an area with marked landscapes of flat, level to nearly level, very gently sloping to gently undulations to moderately sloping or rolling. It is basically a delta formed by two big rivers, the Tamontaka River and the Rio Grande de Mindanao. Basically 70% of its total land area is below sea level. There are only 2 existing elevated areas in the city, the PC Hill and the Timako Hill with an altitude of 90 and 150 feet, respectively. Rio Grande de Mindanao – this is the largest river in the Philippines and the longest in the whole Mindanao region. With the estimated long of 182 kilometers and 96 meters wide, this river is crisscrossing the whole area of the city. This river is good for water sports and boat racing. Kutang Bato Caves – this is the only cave in the country that is right in the heart of the city. It has various entrances are all within the roads. Sultan Haji Hassanal Bolkiah Masjid – this is the largest mosque in the Philippines. Shariff Kabunsuan Festival – this festival is celebrated every December 15-19, which is celebrated in honor of Shariff Mohammad Kabunsuan, an Arab missionary from Johore who planted the seed of Islam in Central Mindanao. On this event, certain presentations are performed such as dances. There are also many recreational activities and sports. Highlights in this festival are Dance Parade, Banca Race and the re-enactment of Shariff’s arrival. Araw ng Kutabato (Cotabato Day) – celebrated every June 12-25, this is the biggest celebration in all of the city’s festivals. This festival is held to commemorate the city;s charter day.